Please visit our Donate page (under "Contact") to learn more about donating to help fund the continued care and maintenance of the newly restored Glendale Bell Tower. One of Akron's greatest landmarks is easy to overlook -- even though it's at the top of a hill. Tall trees and thick bushes obscure a beautiful stone structure that dates back to the Victorian Era. Vandals stripped away its usefulness decades ago, but the rustic building still looms large in local history. 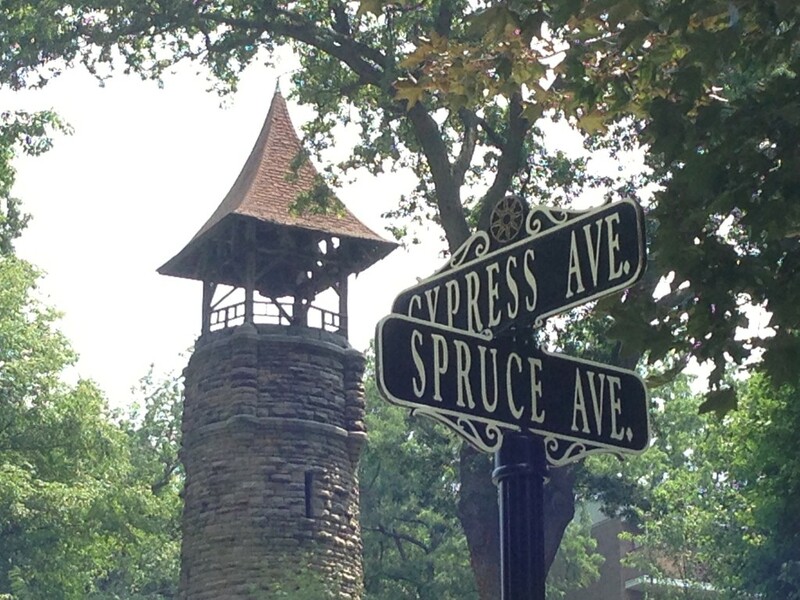 Construction began in August 1883 on a 60-foot bell tower at Ordnance Hill along Cypress Avenue near Willow Brook. Those geographical names don't mean a lot to most people today. They refer to nearly forgotten features inside the front gate at Glendale Cemetery. Founded in 1839 as Akron Rural Cemetery -- so called because of its location on the western edge of town -- Glendale was as much a recreation area as it was a burial ground. Its wooded hills, green valleys and blue ponds served as the setting for carriage rides, romantic strolls and family picnics in the 19th century. 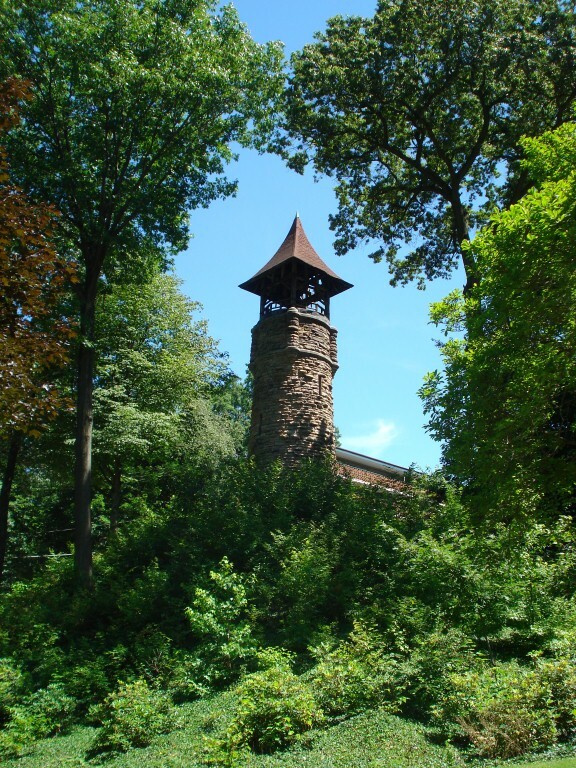 In 1889, Akron historian Samuel Lane described the picturesque landscape in idyllic terms: "Approaching the grounds from the city, through Glendale Avenue, following the tortuous course of Willow Brook, with high bluffs and overhanging trees on either side, with the superintendent's handsome stone lodge upon the right, the high stone bell-tower on the left and Akron's splendid Memorial Chapel, in honor of her deceased soldiers, in front, nothing can be more sublimely beautiful than the entrance to this truly magnificent city of the dead, with fresh surprises at almost every turn while driving or walking through the grounds." The bell tower was meant to complement the Civil War Memorial Chapel, which was dedicated with great solemnity in 1876. While the Gothic chapel's construction cost $25,000 (more than $650,000 in today's money), the stone tower cost $1,000 (roughly $27,000 today). 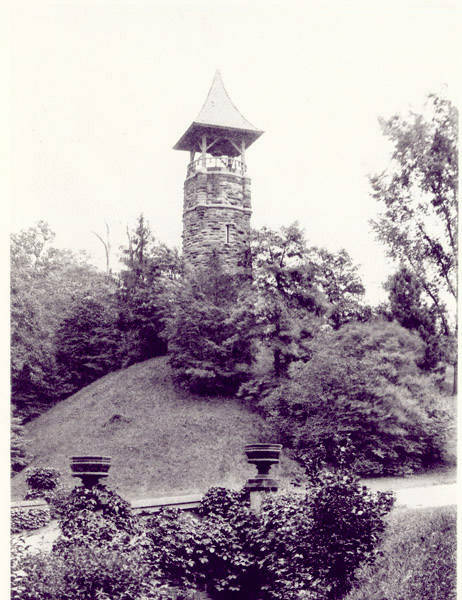 The Ladies' Cemetery Association donated the money to construct the tower after purchasing a 700-pound bell in 1880. Akron architect Frank O. Weary, who designed the chapel and caretaker's lodge, was the logical choice to lead the bell tower project. On a knoll overlooking the chapel, Weary envisioned a circular tower more than 60 feet high and 15 feet in diameter. The citadel would feature four turrets and a belfry with a pyramid roof. 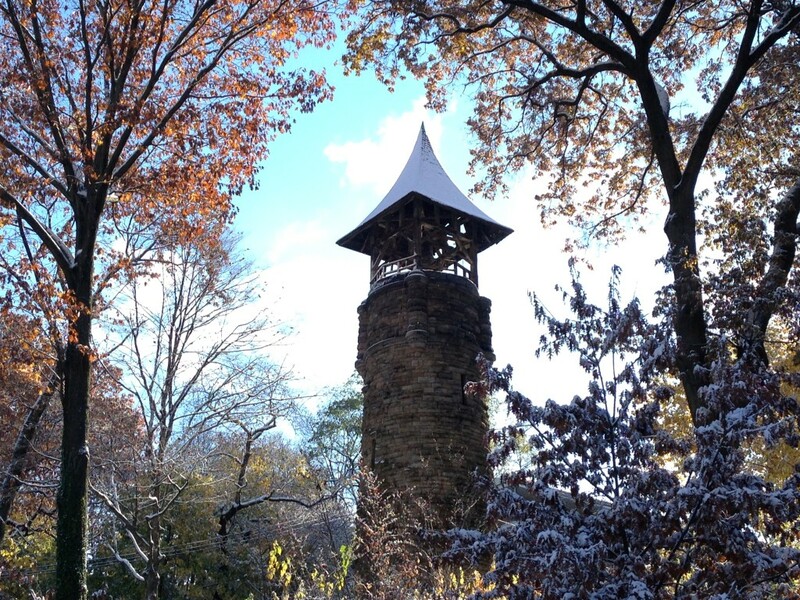 "The lower section of the tower will be constructed of Peninsula stone, rustic finish, and 40 feet in height," the Summit County Beacon reported in August 1883. "This will be surmounted by rustic frame work, eight feet high, and crowned with a tile roof 14 feet high. The entire length of the tower will be 64 feet." Akron builder Alfred W. Barnes, a stone mason, served as the general contractor. He went around and around in circles, carefully mortaring hand-cut stones, as the tower rose. The upward spiral took nearly three months to complete. In early November, the heavy bell was lifted into position, but there was no elaborate ceremony to mark the occasion. Citizens didn't know the tower was working until they heard the deep reverberations. The magnificent tone echoed across the canal town of cereal mills and reaper factories. It became a familiar sound throughout the community. Every day at 6 p.m., a caretaker climbed the hill, entered the tower and pulled a rope. The loud peal signaled the closing of the iron gates at the cemetery. More significantly, the bell provided the death knell for every funeral procession at the cemetery in the late 1800s. Many of Akron's pioneers were laid to rest as the bell slowly sounded. Bell ringing was one of the responsibilities of caretaker William H. Collins (1876-1955), who spent most of his life at the cemetery. As the son of the original gravedigger, he grew up in a West Exchange Street home on Glendale property. Collins was 7 years old when the tower was built. He began to work at Glendale at age 10 and served for 50 years -- the last 35 as cemetery superintendent. He stood witness to profound changes in the way that Akron mourned. Loved ones were increasingly shielded from the grim realities of death, he said. "Years ago, there were no lowering devices," Collins told the Akron Times-Press in a 1930 article. "Coffins were put in the grave by the means of straps. There also were no linings to the grave. Merely the dirt thrown out in a heap. "Now the caskets are seldom lowered in the grave while the relatives are present. The dirt is covered with canvas and green grass lines the opening. "People don't see any of the roughness of death as they used to. In the old days, they always remained until the last shovel of dirt was thrown in. Very often a stone would hit the rough box with a thud all of which added to the misery of the funeral. Although there is probably just as much sincere grief felt as before, people are not as demonstrative. They all know that we have to die sometime and are prepared for it and are not as apt to regard it as a calamity. People are too busy nowadays to dwell on death. They have other more frivolous things on their minds." One Glendale tradition that ended was the death knell. The bell fell silent in the early 20th century except for special commemorations such as the end of World War I. Trees and bushes grew around the stone tower. Once carefully landscaped, the hill became nearly impassable. Cemetery trustees revived the bell-ringing custom in 1930 with the installation of an electrically operated system. Workers connected wires from the belfry to the superintendent's office so that Collins could push a button a nd make the bell ring. He never had to climb the hill again. The bell continued to operate for years. It tolled with joy in 1945 as Akron residents celebrated the end of World War II, and it might still be ringing today if it hadn't been for the thoughtless actions of a few hooligans. Decades ago, vandals broke into the tower, climbed its spiral staircase and stole the bell's clapper. A cemetery crew sealed off the entrance to prevent further trespassers. 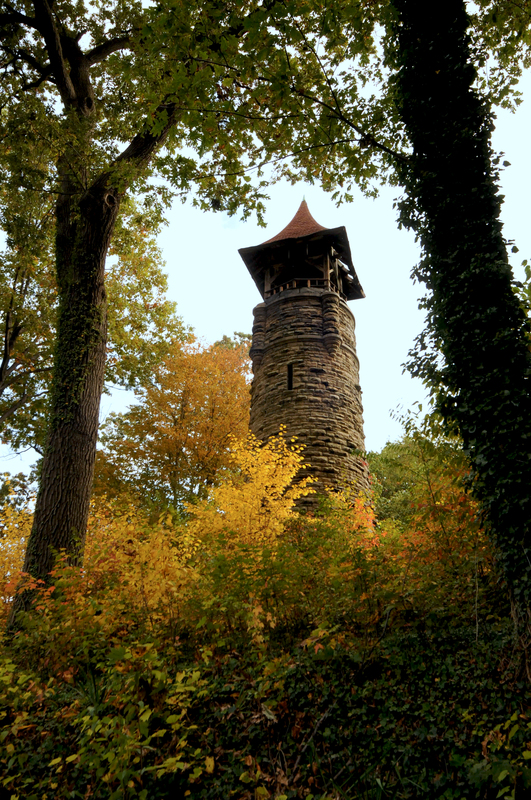 Although the 135-year-old tower is on the National Register of Historic Places, it's easy for Glendale visitors to overlook. The newly renovated Civil War Memorial Chapel, also on the register, draws most of the attention while the bell tower peeks shyly from behind trees. By Mark J. Price. The Akron Beacon Journal, Ohio. Date: Monday, August 11 2008.